ALLOY LOOK SET OF 4 x 15 INCH SILVER WHEEL TRIMS COVERS HUB CAPS 15. 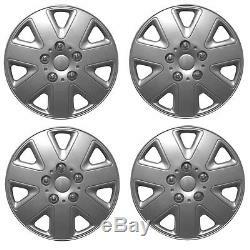 Set of 4 High Quality Silver wheel trims to enhance the look of your car. Full set of 4 Silver Wheel Trims. Secure fitting retaining ring system. Easy & Quick to Fit. Will Update & Transform the Look of your Car. YOU MUST CHECK YOUR WHEEL SIZE AGAINST YOUR OWN VEHICLES TYRE WALL. PLEASE VIEW SECOND IMAGE ON LISTING TO ILLUSTRATE LOCATION OF WHEEL SIZE. On your tyre wall will be your wheel size. PLEASE NOTE - These are UNIVERSAL trims and should fit the listed cars providing you check you have 15 wheels. PLEASE NOTE - These trims may not fit petruding wheel hubs. Please note, wheel trims with decorative wheel studs may be supplied as either 4 or 5 stud depending on the manufacturers current production run. We are proud to provide a customer led service, we work hard to bring you the best pricing throughout the year offering up to date and new to range vehicle accessories and parts. Our parts listings are growing weekly and we can offer accurate fitments using our own software. Our trained staff are on hand in office hours and will be sure to help you. If you are calling about a fitment, please ensure that you have your vehicle registration number to hand. If you are calling about an existing order please ensure you have your order details to hand to enable us to deal with your enquiry effectively. Please allow extra time if paying via cheque. Ireland, Europe & Rest of World. Please make sure there is someone in to sign for the package. In the event of a lost item a replacement will be sent as soon as the loss has been verified by the courier. All tailored car mats are cut to order unless otherwise stated within the listing. Faulty or damaged goods (except wheel trims). Faulty or damaged goods (wheel trims). If you receive a damaged wheel trim within a set of 4 trims. We will NOT replace wheel trims that have been damaged by the customer during fitting, neither will we replace any that are Lost whilst driving. It is YOUR responsibility to ensure fitment is correct before driving your vehicle. If a single wheel trim is confirmed as damaged it refers to the SINGLE item only and NOT the entire set. We will NOT pay for a return of the entire set. Incorrect items or "Not as Described". Number plates are EXEMPT from this rule, as this is a custom made item. These are custom made with YOUR registration details. It is YOUR responsibility to ensure that you provide the correct registration details to us. We cannot change any registration once you have provided it to us. You will simply be charged for a second duplicate order. Manuals that have been taken out of their cellophane wrapper will be rejected as a return. Your Responsibility When Returning Goods. YOU are responsible for ANY damage caused to the product on its return journey. Get the all latest News, Updates and Special Offers about OUR STORE. The item "ALLOY LOOK SET OF 4 x 15 INCH SILVER WHEEL TRIMS COVERS HUB CAPS 15" is in sale since Tuesday, October 14, 2014. This item is in the category "Vehicle Parts & Accessories\Car Wheels, Tyres & Trims\Trims". The seller is "autosounds_direct" and is located in New Romney. This item can be shipped to United Kingdom.